Very cheaply made. Stuck shut. Mirrors don't work, not glass, just tin. 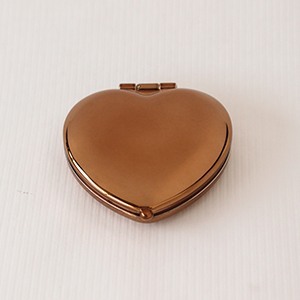 The heart compact is just lovely. Easy opening and closing. The size is perfect for an evening clutch or regular purse. The guest really were impressed with how elegant they are and to be honest, the price was right. Thank you BeauCoup for making my life easy. Quick delivery. 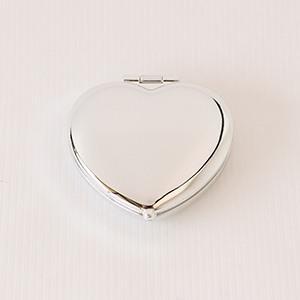 What girl doesn't need a cute compact mirror?! All of my guest at my Girls Night In event loved it! The mirror was perfect for a Birthday party as party favors. did not like the bags they came in, but bought other bags and they look great in them! I am giving these compacts to our ladies Bible study class around Valentine's Day. They are cute and affordable, but I can't get the snap to stay in place when closing on any of them, so I'm assuming they aren't supposed to have a definite closure. All in all, they are nice favours for the price. I used them as a gift for bridal shower with matching chapstick...it was a great hit. Something everyone will use. It was really good. Only thing was it is little small in size than what I have expected. Small and cute though. I am going to use these as favors for a Tea Room Tour, where we go to 2 or 3 Tea Rooms in a day. I have purchased other favors from Beau Coop that have been of better quality. Everyone loved the heart shaped mirrors. some of the outsides were scratched. We put together Valentine's bags and included these mirrors as a little party favor. Everybody loved them and are carrying them in their purse now. Q:Is the mirror inside an actual mirror? Bc some of the reviews say it is not a real mirror, but tin. A:The compact is plastic coated. A:We do not offer personalization for this item. 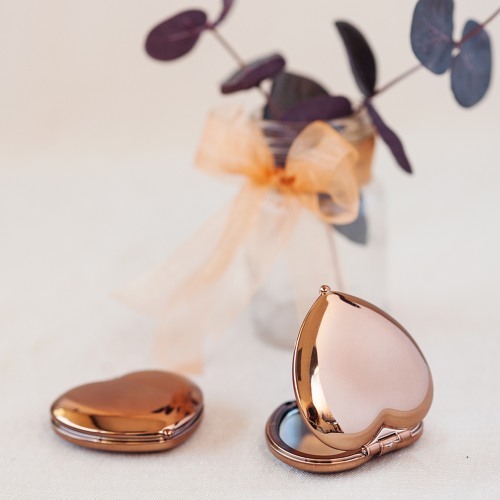 Open your heart to love—love for these heart-shaped compact mirror favors, that is! Each snaps open to reveal your happy, heart-shaped reflection. Great as bridesmaids gifts and bridal shower favors.